← Back to the books again. Guilt is a powerful motivator, especially coming from anonymous internet people. Really, that’s why I’m blogging – it keeps me honest. Those analytics make me feel bad, when they’re bad, and it’s a good kick-start. Dang. It’s blurry. Oh, well. Anyway, I am really really pleased with how it turned out. I think it needs to be slightly bigger, to get all the detail in I wanted, but all in all it’s not a bad first attempt. I’m going to test a little with a single-ply thread on this same fabric, and then a triple-ply (the way it comes on the spool) on a thicker fabric. We shall see. It’s not too stiff and didn’t pucker as much as I expected when I removed it from the hoop. I will be adding pearls soon, just so I can see how that looks. The task portion is once I get all the calibration over with, and move on to the actual skirt fabric. If this is 4 inches across and I have 2 yards of 45″ cotton to embroider, that is, oh, say 80 of these to do, plus a bottom border. I’m going to need a lot of guilt motivation. The second thing is the Hindi. Luckily the people on LiveMocha are really engaged, so I have been motivated to keep checking back. However, knowing that people are following my progress is also a good motivator. I will feel guilty if I don’t say anything about the language learning for a while. By the end of this coming May, I want to be able to find a pen pal and write to them in Hindi. I’d also like to be able to shop in Hindi. By the end of 2010, I want to be able to watch Bollywood movies with the subtitles turned off. I’d also like to start reading books in Hindi. In 2010, I’ll hopefully have learned enough that I can start learning Sanskrit, which will be helpful for the SCA. So far, I can do really simple things, like introduce myself and ask someone if they speak Hindi. I cannot, however, continue the conversation any farther. I do feel that I can get to my goals fairly smoothly. Keep me honest. 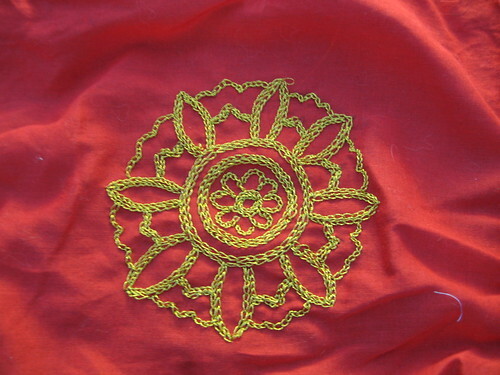 This entry was posted in General stuff, Hindi, sca and tagged crafts, embroidery, Hindi, language, sca, sewing. Bookmark the permalink. Sure. Shall we submit LiveMocha lessons to each other – say one at least every other three days – to keep each other honest? I’ve been pathetically pre-occupied lately but I wanted to stop by and let you know that your embroidery is AWESOME! If you still have the tool that you are using to do this can you show “us” what it looks like? It’s really neat that the stitches look like a crochet chain stitch! Yes. I am currently trying to invent a rig that keeps my camera steady and out of my hands while I do this, but when I figure that out, I’ll post a video (an SCA friend requested this, too).